Poor crash test results for Chinese car | What Car? 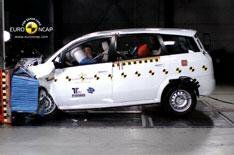 Euro NCAP has published the results of its first crash test for a Chinese car and it doesnt make pleasant reading. The Landwind CV9 MPV was awarded just two stars out of a possible five. Although Landwind claimed that the car had been revamped to meet the strictest European safety standards, Euro NCAP said: In comparison to competitive vehicles in this segment, the car remains poorly equipped, lacking a side protection airbag, a head protection device and electronic stability control. The car was limited to a two-star rating by its overall performance, although it came close to meeting the three-star threshold for adult occupant protection. According to the testers, structures surrounding the passenger compartment were at the limit of their load-bearing capacity. As a result, the passenger compartment was deemed to be unstable because an impact at a higher speed was expected to lead to significantly greater collapse. They added that, while the knees and femurs of front-seat occupants were well protected, there was a risk of injury to their feet and ankles. In the side impact test, protection of the chest area was rated as weak; and, in the pedestrian test, the front edge of the bonnet offered poor protection. Dr Michiel van Ratingen, Euro NCAPs Secretary General, said, It is clear that vehicles from China, India and other emerging countries will become commonplace on European roads in the next few years. By highlighting differences in safety performance we aim to drive the safety of all cars towards and beyond the high levels we see from more well-established manufacturers. We are confident that Landwind and others will rise to this challenge. Along with the Landwinds results, Euro NCAP also published test, results for 13 other cars. The Audi A1, Ford C-Max and Grand C-Max, Kia Sportage, Mini Countryman Vauxhall Meriva and face-lifted VW Passat all scored maximum five-star ratings, as did the Seat Alhambra and VW Sharan. At the same time, a revised version of the Kia Venga was tested and it also received a five-star rating an improvement on the four stars it originally received in February this year. The new Nissan Micra and VW Amarok pick-up were awarded four stars, as perhaps more surprisingly was the Jaguar XF. In the side pole impact of the XF, chest protection was rated as weak and the cars seat and head restraint provided only marginal whiplash protection. Full details of the test results of all 14 cars are available on Euro NCAPs website www.euroncap.com .